Many people around the world are turning to Vegan food, as they believe it is more sattvik or calming and easily-digestible compared to foods that have animal products. Going a step further than vegetarians, vegans do not even consume products obtained from animals, such as milk, milk products and honey. While initially it appears to be difficult to cook foods without ghee, butter, curd and so on, over time, it becomes easy because there are substitutes for everything. For example, in desserts you can use maple syrup instead of honey, and in subzis and other curries, you can use coconut oil or other oils instead of butter or ghee! As far as Indian food goes, there is no dearth of vegan options, especially in the realm of curries. Curries are basically veggies and/or pulses cooked with a myriad spices and herbs, which give them a rich and appetizing aroma and flavour even without using milk products. Thankfully, most curries are very healthy too. From veggies like pumpkin, brinjal and spinach, you will get the day’s dose of antioxidants and other nutrients, while from dals and pulses like moong dal, chana and rajma, you will get ample protein. Curries can be cooked either for lunch or dinner, and served with rice or rotis. The ever-popular Rajma Curry can be had with vegan rotis. Then there is the Aloo Mutter, which is famous all over India. Chana Palak is another brilliant option, which gives you a good dose of vitamins and protein too! Maharashtrian cuisine offers a vast and varied selection of curries, with each region having a classic style and characteristic masala preparation. One such is the Vegetable Kalvan, popular in the Konkan region. Then, there is the Usal, which is almost synonymous with homely Maharashtrian cooking. Other popular dishes made with common veggies are the Batata Ani Flower Cha Rassa and Methi Chi Patal Bhaji . 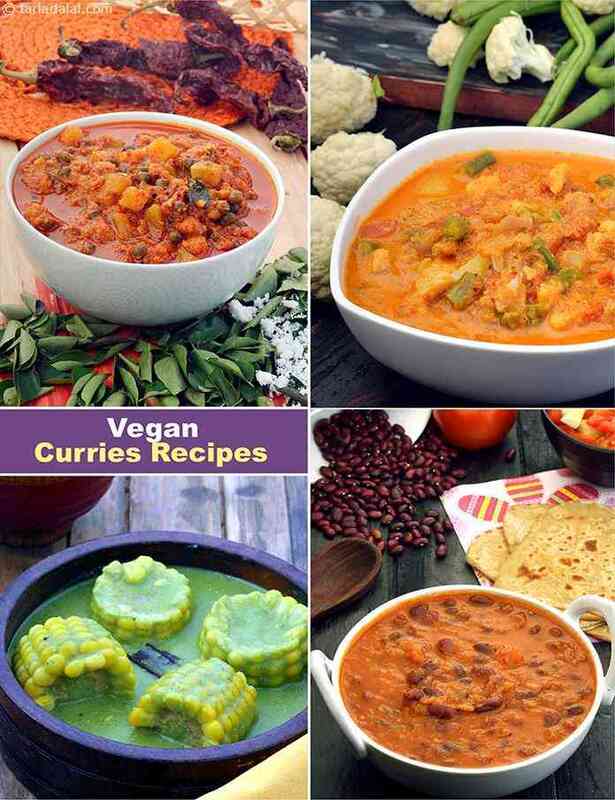 Most South Indian curries are suitable for vegans because they use very little or no ghee and butter. The traditional tempering is usually done with coconut oil or til oil, and coconut-based pastes are used to give the richness and texture, rather than dairy products. The Pumpkin Kootu and Malabari Curry are typical examples. A few dishes might use curds or buttermilk, so vegans need to just watch out for that. One of the ubiquitous South Indian dishes, Sambhar, is now so popular that it is made all over the country and available in Indian restaurants around the world. This is interestingly vegan friendly, so you can dig into idli and sambhar anytime, anywhere! Likewise, every region has a range of curries, which derive their tongue-tickling flavours from herbs, spices and traditional tempering. When selecting a curry, just watch out for cream that is sometimes used to impart richness, curd that is sometimes used as a base and ghee that is sometimes used for tempering. If a curry uses paneer, you can safely substitute it with tofu. If a recipe uses honey, use maple syrup instead. And instead of ghee, you can always use coconut oil, which is not only vegan-friendly but also gives an awesomely rustic and appetizing aroma to the dish! Make sure you buy small quantities of freshly-ground coconut oil, as it tends to get rancid soon. Store it in a cool, dry place away from direct sunlight. It is an essential ingredient for tasty vegan cooking! Once you get the hang of it, you will start automatically filtering recipes when you browse through, and quickly replace the apt ingredients yourselves, so you can then make any recipe vegan-friendly with a few small twists! Till then, you can rely on our website to keep supplying you with loads of vegan recipes for every course, including snacks, smoothies, salads, curries, and what not!